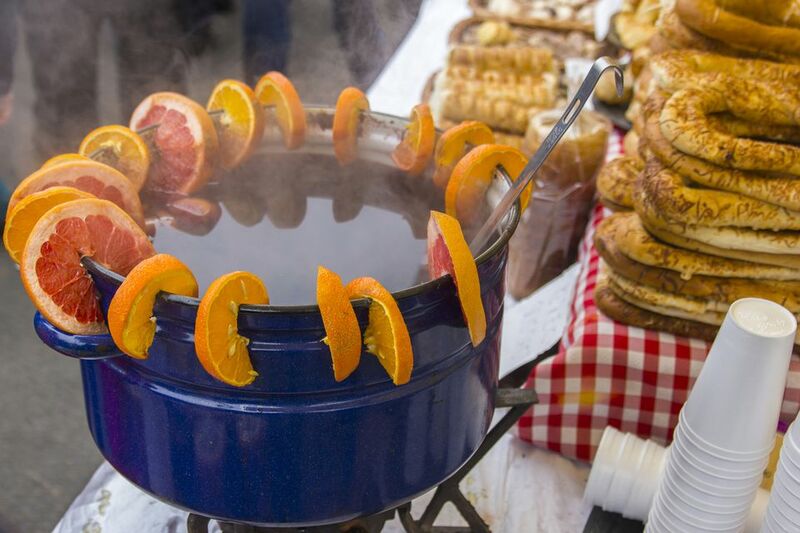 This recipe for Polish hot mulled wine is known as grzaniec galicyjski (grrzzah-NYETS gah-leet-see-I-skee). Grzane is the word for "mulled" and galicyjski means "Galician." The wino (wine) is implied. It's similar to German gluhwein, French vin chaud, and Swedish glogg. It's especially popular served outdoors at Christkindlmarkets or Christmas markets and after sledding, skating or other outdoor winter activities. Gluhwein is the most popular cold-weather drink in Europe. It's an aromatic blend of red wine, sugar, and spices. Czechs call it svařené víno, Hungarians call it forralt bor, Serbs say kuvano vino, Croatians say kuhano vino, Bulgarians call it greyano vino, and Romanians call it vin fiert. In a large saucepan, combine 1-quart dry red wine, 1/2 cup sugar, 5 partially crushed cloves, 1 cinnamon stick, and 1 bay leaf, cracked in half. Heat to dissolve sugar. Bring just to the boil and immediately remove from the heat. Strain and pour into hot mugs.